The history of South African wine dates back to the mid 17th century when Europeans started to settle the country. While the history and politics of South Africa have often been turbulent with frequently fractious relations between Africans and Europeans, South African wine has faced troubled times but also enjoyed periods of great success. According to Hugh Johnson and Jancis Robinson, in their book 'The World Atlas of Wine', "The most dramatically beautiful wine country in the world is surely South Africa". 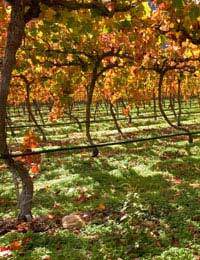 A near perfect grape-growing climate, comparable to the Mediterranean, is complimented by cooling winds and rains that are usually concentrated to the winter. At one time the wine Constantia, Cape Town, was thought to be the finest wine in the world, and after some difficult years resurgent South African vineyards are now considered a success story of New World Wine. In 1652 Jan Van Riebeeck and his party from The Dutch East India Company established the first European settlement at the Cape of Good Hope. In the spring of 1659 Van Riebeeck reported that he had made the first wine at the Cape, and South African wine was born. Van Reinbeck departed the colony and Simon van deer Stel became the Governor of the Cape, and it was he who established the Constantia estate in a valley facing False Bay. 'Vin de Constance' made at the vineyard gained some popularity, but it was Hendrik Cloete, who bought the estate in 1778, who made Constantia wine really famous. Constantia wine was made from a blend of Muscat de Frontignan Pontac, red and white Muscadel and Chenin Blanc. It became the drink of choice for Kings and Emperors across Europe. Napoleon was a huge fan, and after his exile to St Helena in 1815 he was supplied with wine from Constantia until his death in 1821. In 1833 King Louis Philippe of France became the biggest buyer ever of Constantia wine. The Cape wine industry flourished for most of the 19th century, winning medals and gaining mentions in the literature of Jane Austen and Charles Baudelaire. However, after years of success the South African wine industry suffered a series of major setbacks. A plague of Phylloxera, the grape-destroying pest, decimated the country’s vineyards. The Anglo-Boer War and the collapse of the British wine market for Cape wines hit the industry hard. The Cloete family were bankrupted and sold the Constantia estate to the government. In the early years of the 20th century over production of poor quality wine resulted in a slump in prices, and in 1918 huge amounts of unsaleable wine was poured down the drain. In the same year growers in the Western Cape founded ‘Koöperatieve Wijnbouwers Vereniging van Zuid-Afrika Bpkt’ (KWV). This co-operative controlled wine production and prices, and dominated the wine industry until the end of apartheid. In 1925 Abraham Izak Perold, the first Professor of Viticulture at Stellenbosch University, developed the Pinotage grape, which would eventually become South Africa’s signature variety. Pinotage is a cross of Cinsault with Pinot Noir. Perold was trying to take the best qualities of both grapes and at first the new variety proved hard to grow. The first bottles of Pinotage appeared in 1961, and received mixed reviews in the world of wine. A group of British Masters of Wine, visiting South Africa in 1976, compared the taste to “rust nails”! Disparaging “rusty nail” remarks about Pinotage and other South African wines were often due largely to the country’s politics and bad image through the years of apartheid. The National Party who came to power in 1948 implemented harsh racist laws, and as a result the country faced international boycotts on produce including wine. South Africa was politically and culturally isolated for decades, and the wine industry stagnated until the end of apartheid in the 1990s. In recent years new vineyards have been established and winemaking techniques are improving. Generally the focus has shifted to making new fashionable reds, with Pinotage finally being valued as a "local treasure". The deep red wines made from the grape are typified smoky, bramble and earthy flavours, sometimes with notes of bananas and tropical fruit. Pinotage has been successfully grown abroad but remains South Africa’s pride and joy.International acceptance and a new attention to detail have helped establish high quality and much sought after South African wine. This "dramatically beautiful wine country" is definitely on the way to once again being one of the major wine producing and exporting countries in the world.